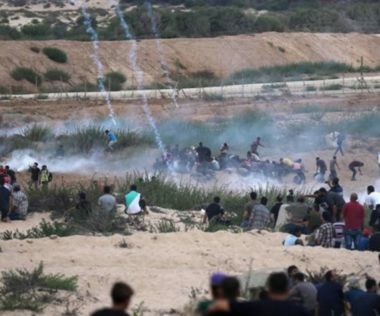 The Palestinian Health Ministry has reported, Monday, the Israeli navy injured 93 Palestinians, including 37 with live fire, during a boat protest against the ongoing Israeli siege on the Gaza Strip. The Health Ministry stated that the soldiers engaged in an excessive use of force, and fired dozens of live rounds at the boats, and the protesters at the shore. It added that the army also repeatedly targeted medics and ambulances with live fire and gas bombs. The Ministry has confirmed that the Israeli attacks led to 93 injuries, including 37 who were shot with live fire. 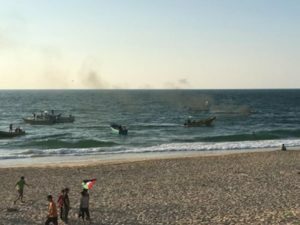 Media sources in Gaza said several Palestinians burnt tires, and floating them on the water, while the army fired more live rounds trying to stop the boats from sailing, although they were in Gaza territorial waters.